New-York-New York Hotell och Kasino låter Vegasbesökarna få en smakbit av “The Big Apple” och underhållning från Broadway. För barnen finns Manhattan Express, en bergodalbana som åker runt kasinot i 110km/timme. Vid Coney Island finns arkadspel, radiobilar och laser-spel. För de vuxna finns Cirque du Soleil produktionen Zumanity och Rita Rudner som kör sin stand-up komedi. Kasino: Yes, 84,000 square feet. Casino games include Blackjack, Craps, Roulette, Mini Baccarat, Pai Gow Poker, Caribbean Stud Poker, Let It Ride, Big Six, Casino War and Keno. More than 2,000 slot machines including Wheel of Fortune, Monopoly, Megabucks, Jeopardy, Slotopoly, Blazing 7’s Dollars, Empire Slots, Elvis and Moneytime. Race & Sport booking: Yes, a 40-seat race and sports book, equipped with 45 televisions and 12 big screens. Restauranger: New York-New York has the following dining options: America, Chin Chin Café, Coney Island Pavilion, Gallagher’s Steakhouse, Gonzalez y Gonzalez, Greenberg’s Deli, Il Fornaio, Nine Fine Irishmen, ESPN Zone, Schrafft’s Ice Cream and the Village Eateries, which offers a variety of smaller food venues. 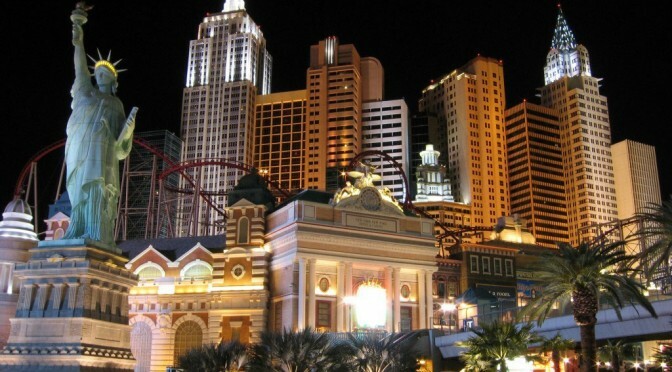 Underhållning: Entertainment includes the revealing Cirque du Soleil show Zumanity, comedian Rita Rudner, Dueling Pianos at the Bar at Times Square and live entertainment in the lounges. Attraktioner: Yes, the Manhattan Express. Pool: Yes, one pool, with capacity for 840 people, and three Jacuzzis. Spa: Yes, The Spa offers multiple types of massages and services. The spa also has a full-service salon. Affärer: Cashman’s Photo Magic, Regis Signature Salon, Houdini’s Magic Shop, I Love NY-NY Signature Shop, Manhattan Express Photo, The NewsStand, Vegas Express, Las Vegas Harley-Davidson, Grand Central Watch Company; and the Soho Village, which provides an array of New York-themed fashions and gifts.